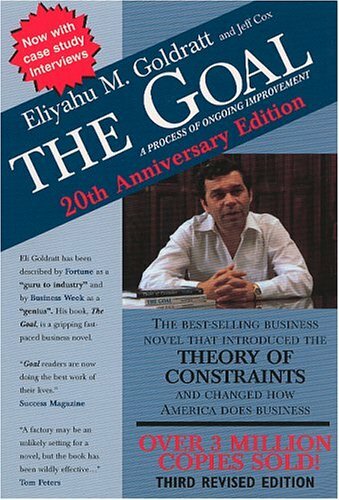 Eliyahu Goldratt's business novel teaches about the Theory of Constraints. We are just about at the July 4th weekend, so a book about business may not be top of your reading list. I urge you to hang in, however. Eliyahu Goldratt’s The Goal is a business novel that combines business acumen and philosophy with a surprisingly engaging and deftly written personal narrative. Many thanks to my brother-in-law Josh Kelly for lending me his copy of this book. The Goal contains the theory and application of the theory of constraints. As the book opens, Alex Rogo is managing a metalworking plant that, like his marriage, is barely functional. These two interrelated strands of marital discord and company dysfunction form the book’s central threads. Alex is largely left to tackle his marriage on his own, but gets help on the business end of things from Jonah, a distance acquaintance who bears more than a distant resemblance to Goldratt. Through a series of conversations and phone calls with Jonah, Alex starts to run his plant more effectively and strategically, and, in so doing, comes to value and reconnect with his wife, who had moved out of the house.